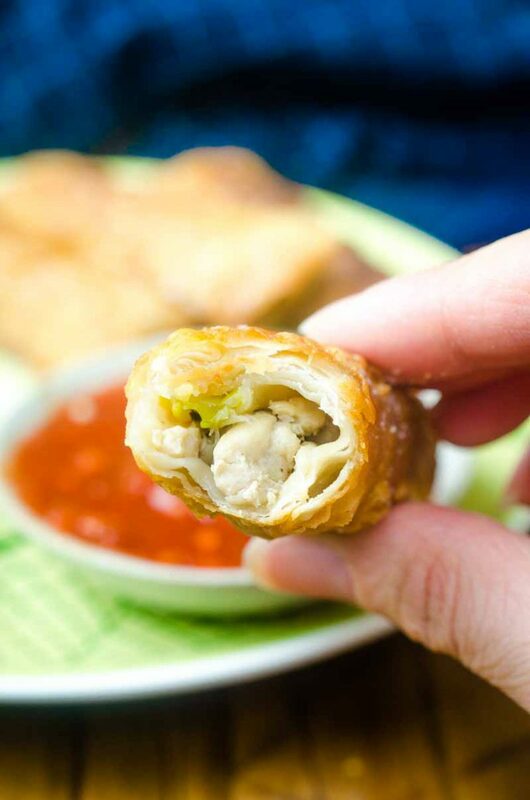 Crispy Ginger Chicken Egg Rolls are loaded with ground chicken, fresh ginger, mushrooms, green onions and cilantro. A classic Asian appetizer! 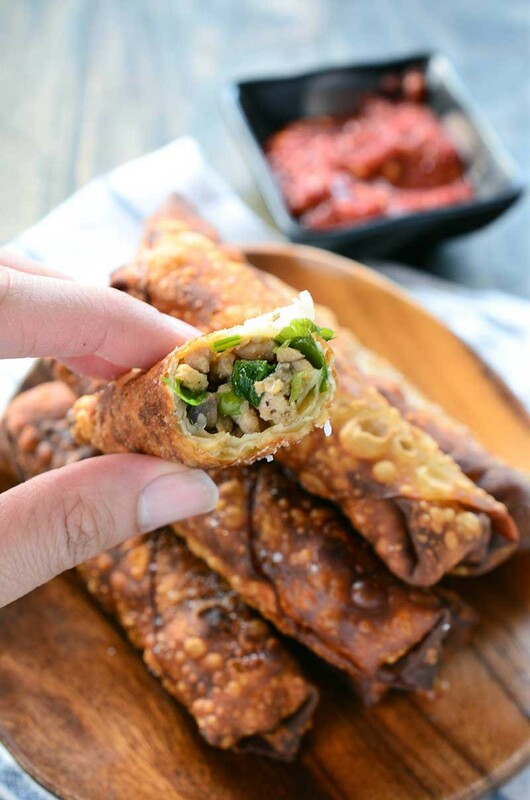 If you are looking for a classic, crispy fried appetizer that is perfect for parties then these Ginger Chicken Egg Rolls are it. 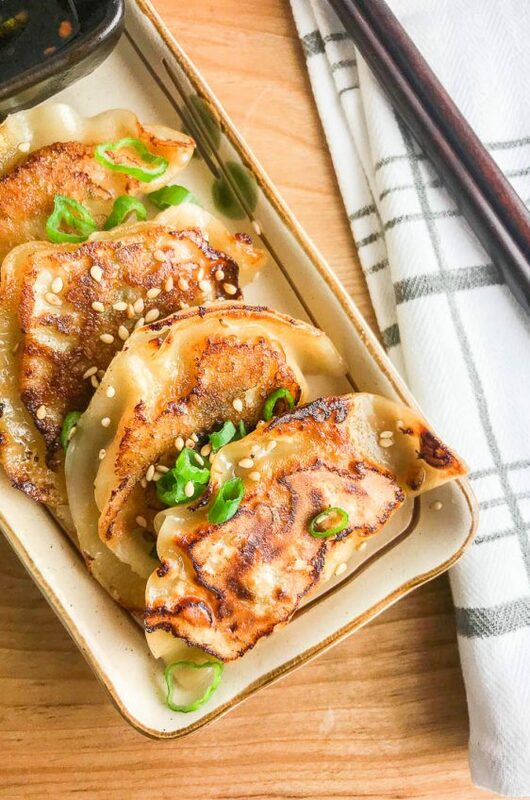 They are loaded with ground chicken, mushrooms, green onions, fresh ginger and cilantro and then fried to perfection. 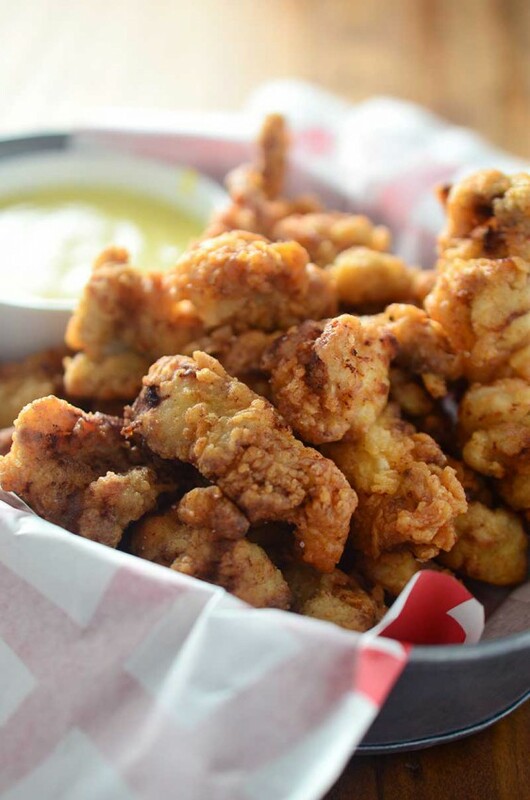 Appetizers don’t get much more perfect than this. Egg rolls can be a labor of love. I should know, as part of a Filipino family, I grew up making lumpia, the Filipino version of an egg roll. It was always an all day process. We would make the filling, allow it to cool then would spend a couple of hours gathered around the table rolling it. We’d roll about 100 or so. But oh are they worth the work. 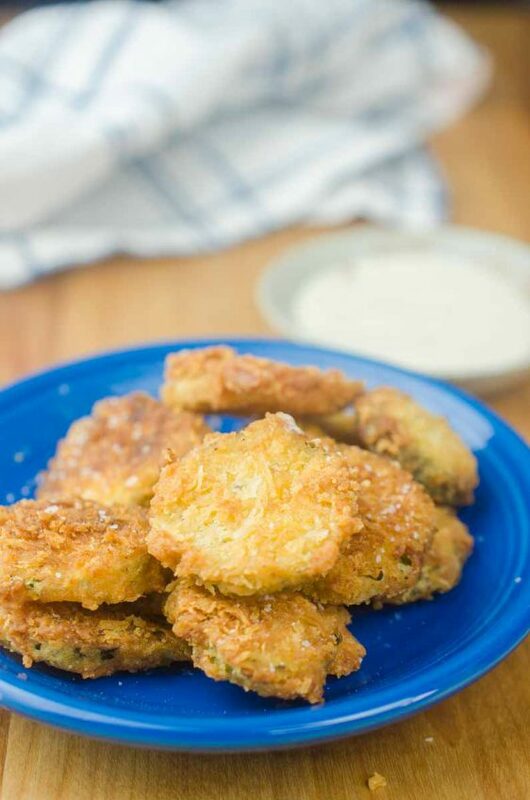 They are crispy and crunchy on the outside and loaded with all kinds of goodies on the inside. This recipe for Ginger Chicken Egg Rolls make far less than the lumpia that I made growing up so they are done in a lot less time. But they are still full of all kinds of deliciousness. What makes a good filling for egg rolls? One of my favorite thing about making egg rolls is that you can stuff them with basically whatever you want. I have made them with BBQ pulled pork, a pizza filling and a chipotle chicken filling. 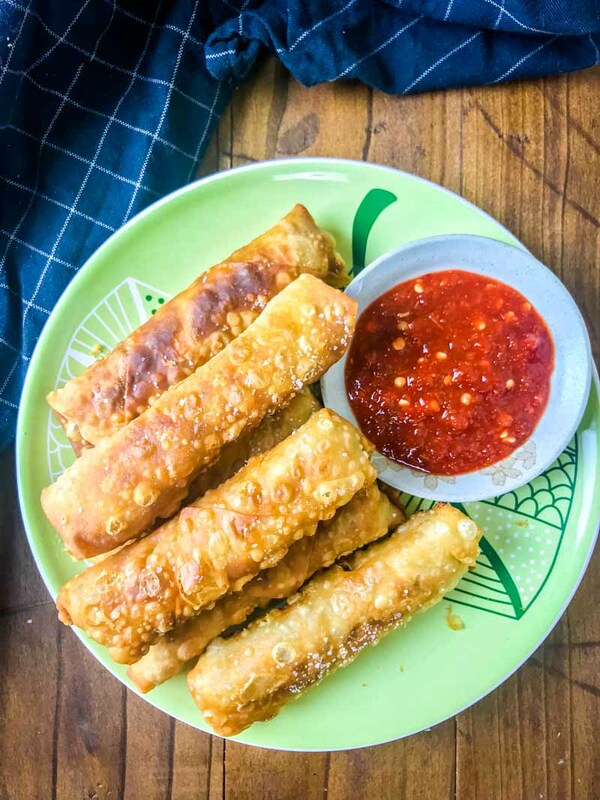 When I set out to make these Ginger Chicken Egg Rolls, I wanted to make something a bit more traditional so I stuck with the Asian flavors of ginger, soy, sesame and fish sauce. You should be able to find each of those sauces in the Asian aisle of a well stocked grocery store. 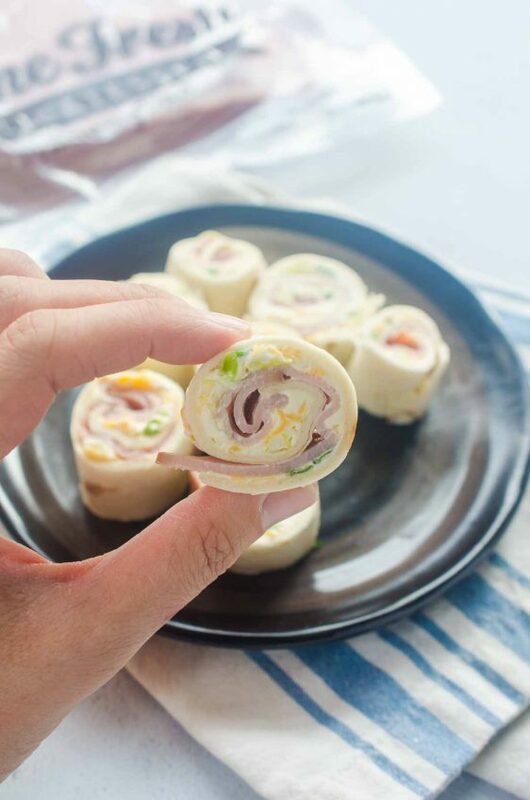 What kind of wrapper do you use for chicken egg rolls? I get asked this question a lot. I am fortunate enough to live in a large city that has a very well stocked Asian grocery store: Uwajimaya. If you ever find yourself in Seattle, you should definitely check it out! I can find just about any kind of Asian ingredient I want there. Including egg roll wrappers. There are several out there. They will be in the refrigerated or frozen section and will be labeled as egg roll, lumpia or spring roll wrappers. I prefer the Menlo brand but any will do. If you don’t have an Asian grocery store near you, you should be able to find egg roll wrappers in a refrigerated section at a well stocked grocery store. The brand options will likely likely be limited but they should carry at least one. Can you bake chicken egg rolls? Yes, you can! That being said, I really do prefer to fry them. They get much crispier that way. If you would like to bake them, brush them with oil first and bake them at 400 for 20 minutes flipping them halfway. But again…they are really best fried. Can you freeze chicken egg rolls? Yes! I do it all the time! Once they are rolled, I freeze them on a single layer on a cookie sheet. Once they are frozen, I place them in freezer bags. That way I can pull out however many I need each time. What dip do you use for chicken egg rolls? Finally, we should talk about dipping. Egg rolls are great on their own but I really do like dipping them into different sauces. 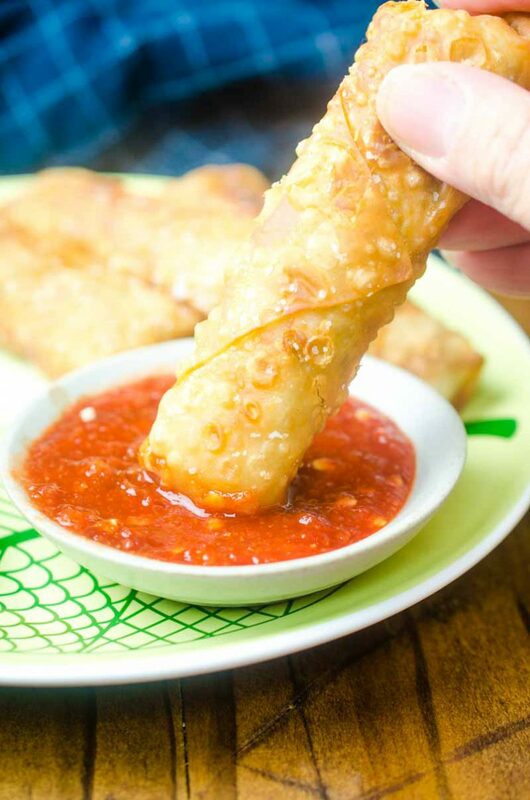 When it comes to these Ginger Chicken Egg Rolls, I prefer to dip them in a garlic chili sauce. I like the contrast of the spicy sauce and the sweet ginger. Ryan, prefers to dip them in sweet chili sauce. Whatever you dip them in, or even if you don’t, you are bound to love these crispy, crunchy Ginger Chicken Egg Rolls. Note: Originally published in 2016. Photos updated 2019. Heat 1 tablespoon avocado oil in a large skillet or wok over medium high heat. 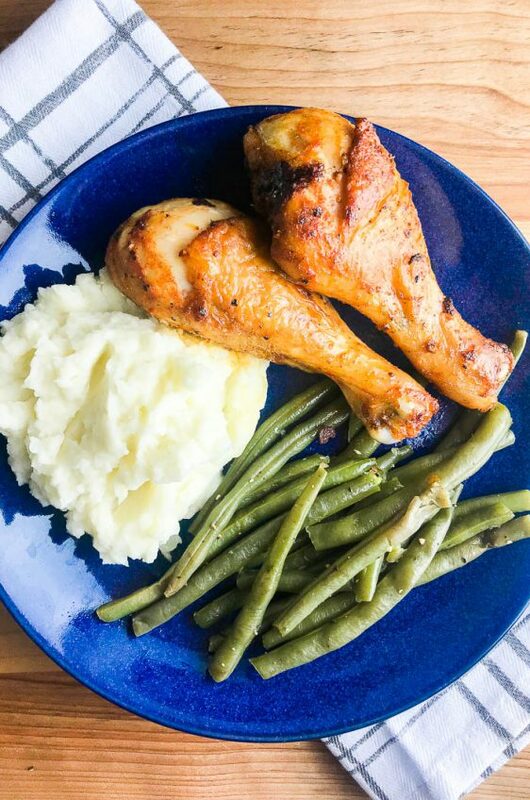 Cook chicken just until it starts to brown. Add in ginger, mushrooms, green onions, soy sauce, fish sauce and sesame oil. Cook until chicken is cooked through and mushrooms are softened. Remove from heat and stir in cilantro. Season to taste with salt and pepper. 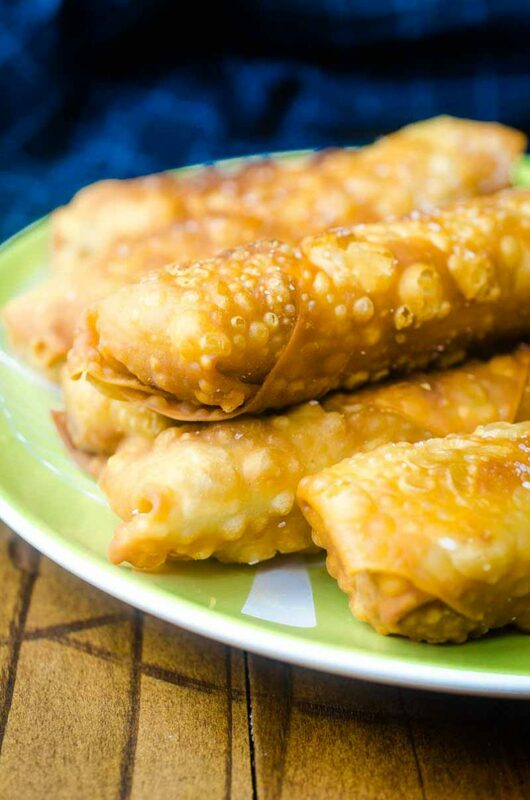 To assemble the egg rolls: using one egg roll wrapper with one point towards you, place 1 tablespoon of filling about an inch from the point closest to you. Working away from you, fold the wrapper over the filling. Next fold in both sides. Dip a pastry brush into the egg and brush the edges. Continue rolling to seal completely. Repeat with remaining filling and wrappers. Heat 1/2 inch of oil in a skillet to 350 degrees. Fry egg rolls, in batches if necessary so you don't crowd the pan, until golden brown, about 3 minutes. Transfer to a paper towel lined plate, sprinkle with salt. Repeat until all egg rolls are fried. 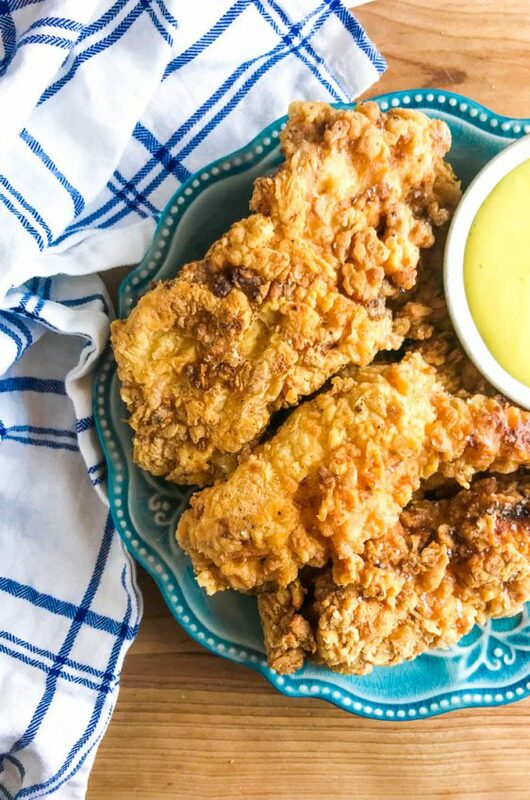 Serve with sweet chili or chili garlic sauce for dipping. This looks really delicious! Something my kids will love! What a great appetizer idea! They look and sound so tasty! Hi Roberta! I’ve always frozen my egg rolls in a single layer in the freezer. Then place them one by one in resealable plastic bags, usually in packs of 5. Then when I am ready, I thaw them in the refrigerator. I have never had an issue with them getting mushy.Sometimes the wrapper will be softer but just make sure that your oil is 350 degrees and they should fry just fine. I hope this helps! Mouth watering! I love how crispy these egg rolls look! 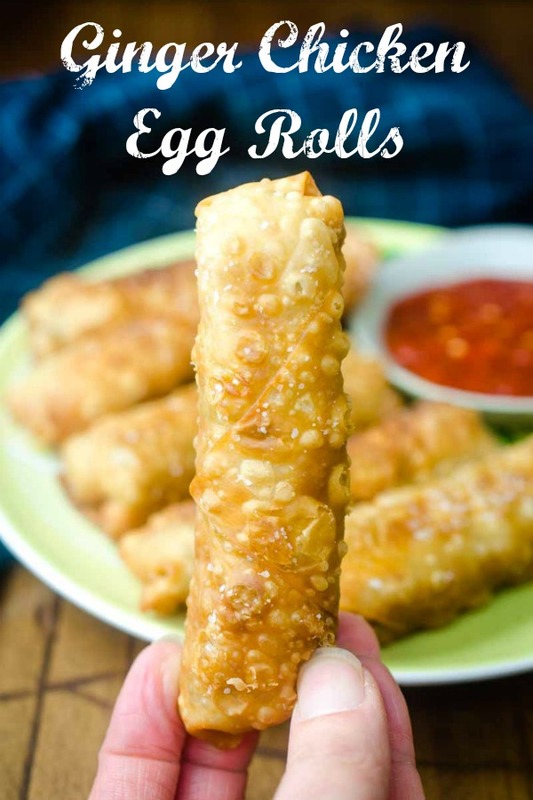 Egg rolls are a craving of mine…but how much better to make it yourself! These look fantastic!!! Wow, it looks crispy, I love it. I will try to make it. My mouth started watering the instant i saw the pictiure of this recipie. We are obsessed with egg rolls! These look amazing! I’m gonna have to make these for Thomas! He’s gonna love them! I love the flavors you packed in there! Looks delicious! I’ve always been such a die-hard fan of egg rolls! These sound awesome, such a great flavor profile! Love your egg rolls and especially the ginger and mushrooms that are on the inside. Thank you! 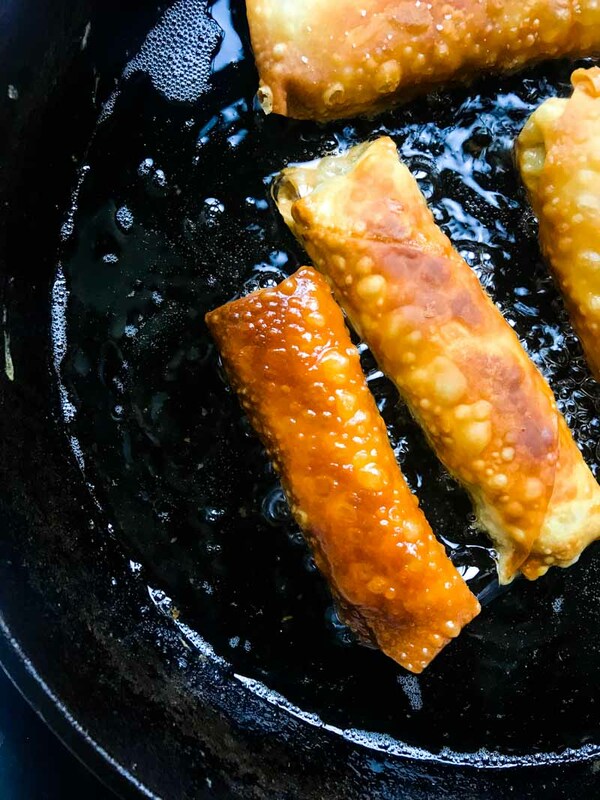 We just made Vietnamese Egg Rolls last night, now we need to make these! So good! Always worth the work! The dipping sauce is where it’s AT! Loving how crispy these egg rolls are – that’s exactly how I like mine! You are so right, it’s always about the dipping sauce for me too. I love the flavor of these egg rolls, classic yet utterly delish.